Surprised to see a post already? 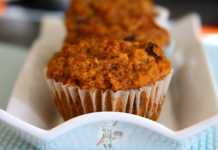 I tried this bran muffin recipe a couple of weeks ago but posting it just now. Before talking about the recipe, I would like to thank each and everyone of you who took the time to congratulate us by recording it here in the blog and for the emails. We really feel very blessed to know that there are so many people out there wishing our well being. Thank you all once again. 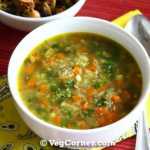 Will be back soon but now to this recipe. 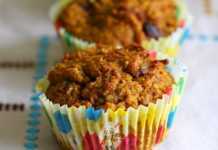 Are you looking for low fat, overall healthy, kids approved and tasty bran muffin recipe? Then you are in the right place. The answer is this raisin bran muffin recipe. 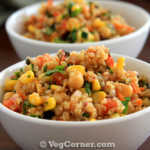 Healthy doesn’t need to taste like cardboard is being proved yet again. Bran and tasty; healthy and kids approved sounds like oxymoron right! But you have to believe me when I tell that this recipe is all of those. I thought that I would never like another muffin after baking these whole wheat chocolate chip muffins but this raisin bran muffin joins my favorites list. I found this low fat muffin recipe in Weight Watchers’ Best-Ever Desserts book. The original recipe had one egg which I have replaced with some unsweetened applesauce and baking powder and it definitely worked out good. The taste was phenomenal if you love the taste of whole wheat pastry flour like we do. I really miss this flavor and texture while baking with plain all purpose flour. I’m not sure if this bran muffin recipe will turn out as good as it did with regular whole wheat flour. Fiber One Original cereal has whopping 14gms of fiber per 1/2 cup (0 gm sugar), so its about 42gms in total for this entire bran muffin recipe. Put together the fiber from the whole wheat pastry flour and each muffin has about about 6gms of fiber. The amazing thing is with all this fiber it still tastes so good. I added mini M&M’s to get my son to eat it but now I feel that I wouldn’t have needed it after all. So I’m definitely trying this recipe again without the M&Ms. 15 Mins 25 Mins 12 regular size muffins. Combine together the cereal, raisins, and oil in a large bowl. Pour the boiling water over the cereal mixture and stir together; let cool slightly. Add the buttermilk, maple syrup, unsweetened applesauce and water to the cereal mixture; stir until well mixed. In another bowl, whisk together the whole wheat pastry flour, baking soda, baking powder and salt. Add the flour mixture and chopped walnuts to the cereal mixture and stir until just combined. Cover the bowl with plastic wrap; let stand 15 minutes. Preheat the oven to 400F/200C for 15 minutes. Line a 12-cup muffin pan with paper liners and spray it well with non stick cooking spray, so that you can peel off the paper easily. After 15 minutes the batter looks like its fermented with little bubbles. Now toss in about 3 tablespoons of the M&Ms if you are using. Do not mix it too much because the colors start bleeding. Reserve the rest to sprinkle over the muffin batter. Fill the muffin cups evenly with the batter; approximately 3 tablespoons of batter per muffin. Sprinkle the balance M&M’s and smooth the batter lightly before putting the pan in the oven. Bake until a toothpick inserted in the center comes out clean, 20-25 minutes. Mine was done around the 21st minute itself. Cool the pan on a rack for 5 minutes. Remove the muffins from the pan and let cool completely on the rack. After tasting the muffins I felt that I wouldn’t have needed the M&M’s after all because it was so good. 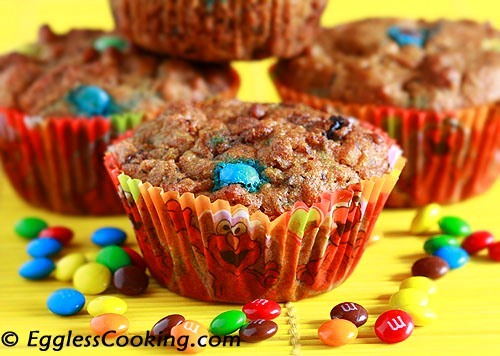 So if you still think that you need to lure your child into eating these healthy muffins just use about a tablespoon of mini M&M’s or mini chocolate chips to sprinkle over the muffin tops to grab their attention. Usually the muffins peel off from the paper liners within minutes of taking it from the oven, which didn’t happen in these bran muffins. I don’t know if its because I didn’t spray the paper liners well or because the recipe doesn’t have much fat. So even after an hour or so when I tried to remove one muffin some portion of the it was stuck to the paper, but they peeled off perfectly after about 3 hours. I am new to this website. I have had an allergy to eggs for years and have searched for great….not okay…recipes.This one rates 5 stars!!! Beautiful and delicious muffins.Congrats for the new arrival, Madhuram. And best wishes for strting a new chapter in your life. Take care. 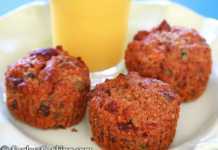 Colorful and healthy muffins Madhu.. Awesome muffins. Looks so soft and yumm. wow muffins looks so soft n delicious …love ur healthy version ..
awesome idea..never used cereal in baking b4.. I really like this idea! 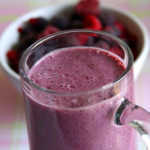 looks so yummy! 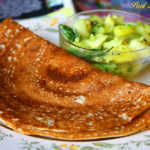 was really astonished to see the recipe so quick. Thank you very much.